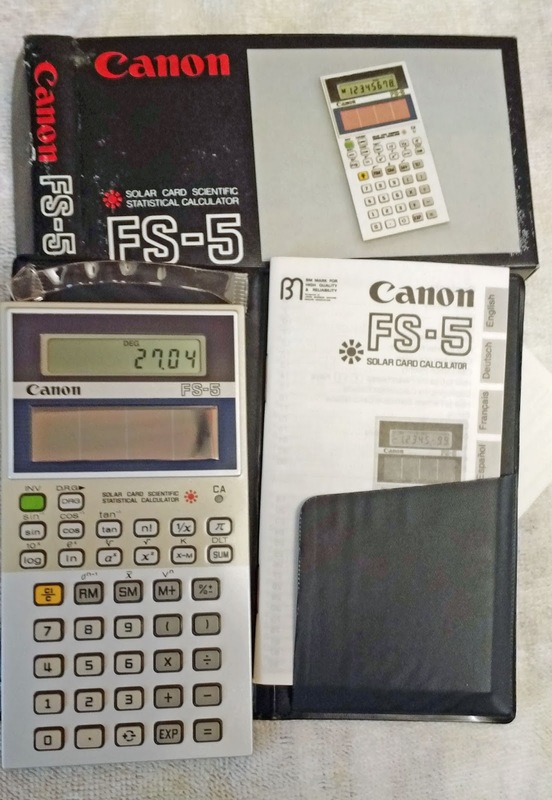 The Canon FS-5 is a thin as a credit card calculators that came popular during the 1980s. Other calculators that belong to the credit card size are Casio fx-82 and TI-30 SLR. All the buttons are small, but are responsive, especially the small round clear all ([CA]) button. The display is 8 digits (which reduces to 5 digits when powers of ten are displayed). One thing to note, the power function is labeled by a^x. The statistics package that the FS-5 offers is very simple: mean, sample deviation (labeled by σ^(n-1)), and population variance (labeled by v^n). You enter statistics mode automatically by pressing the [SUM] button and delete last entry by the [INV] [SUM] (DLT). To return to mathematics mode and clear all statistics registers, press the [CA] button. The FS-5 run by solar power, with no battery backup. Be sure to be in adequate light. This is a nice, thin, and simple scientific calculator. I like the key design, especially since the buttons are small, they are responsive. The calculator looks pretty cool too. If you can find one online, consider getting it. I paid $15, I think that is reasonable, somewhere in the teens. The CM-100 is fully ran by solar power, so make sure you have adequate light to operate the CM-100. 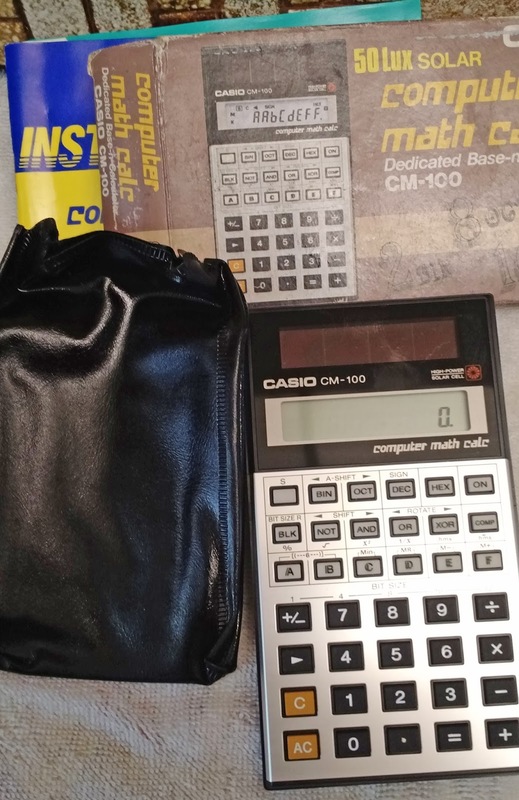 The CM-100 is part of a rare genre of scientific calculator: the calculator that is dedicated to base conversions, bit shifting and rotating, and displaying integers up to 32 bits (dwords). Perhaps the most famous calculator of this family is the much sought after Hewlett Packard HP-16C. On the Texas Instruments side, there was the TI-Programmer. COMP: Math Mode. All numbers are represented in decimal with floating point arithmetic. The parenthesis, %, √, x^2, 1/x, HMS conversions, and memory functions are the primary functions on the 2nd and 3rd row of keys. Pressing [ ON ] clears the calculator and sets the CM-100 to COMP mode. Entering numbers in degrees-minutes-seconds requires a repeated press of [ hms ]. Note: For the BIN, OCT, DEC, HEX modes, the parenthesis and memory functions become shifted functions, and instead of the %, √, x^2, 1/x, DMS conversions, we have BLK (block scrolling), shifting, NOT, AND, OR, XOR, and rotation. BIN: Binary Mode. All integers are represented in base 2. Pressing [BIN] converts the integer to binary. OCT: Octary Mode. All integers are represented in base 8. Pressing [OCT] converts the integer to octave. DEC: Decimal Mode. All integers are presented in base 10. Pressing [DEC] converts the integer to decimal. Example: Display 3,723,601 in binary bits. Assuming base 32 is set (which I think is the default). Press [BLK] to cycle through the blocks. The decimal points indicate which block you are viewing. Hence, 3,723,601 in binary is 00000000 00111000 11010001 1001001. Unsigned (no display indicator): All integers are 0 or positive. The range is from 0 to (2^n) -1, where n is the number of bits. Signed (a SIGN indicator): Integers can be positive or negative. The first bit is the sign bit which dictates the sign of the integer (easiest to understand in Binary mode). The range is from -2^(n-1) to 2^(n-1) – 1. It is well known that most calculators that have base calculations include the Boolean algebra functions NOT, AND, OR, and XOR; pretty standard. What the CM-100 adds is the shift and rotate functions. I am going to try to explain the shifts as far I understand them – if you have a better explanation, please comment and it will be appreciated. I think this is best understood in the context of Binary. A-Shift: Arithmetic Shift Left/Right. This moves the bits left or right by 1. Any bit that “shoved” off is discarded. In Signed mode, Arithmetic Shift Right replaces the sign bit with whatever was the previous signed bit. Otherwise, the new bit is 0. Shift: Logical Shift Left/Right. This moves the bits left or right by 1. Any bit that “shoved” off is discarded. The replaced bit is always 0. Rotate: The bits rotates left or right by one digit. All bits are otherwise retained. The only difference is when you are working with signed integers and when the shifts are to the right. To illustrate, I executed both shifts on the CM-100, in Signed and Binary modes with 4 bit size set. Arithmetic Shift Right ([ S ] [OCT] (A S>)), Logical Shift Right ([ S ] [AND] (Shift>)). Obviously, the HP-16C was also programmable (203 bytes) and operated in RPN mode. Furthermore, the HP-16C had double arithmetic (multiplication, division, and remainder). However, the CM-100 has the decimal/decimal-degrees-seconds conversion and it was solar. 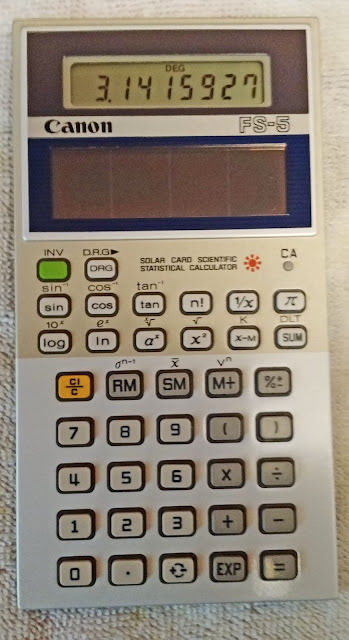 If you want to have a base-dedicated calculator and you had the budget in mind, consider buying the CM-100. I bought one through eBay (Wolfs Big Bad Garage) for about $25. The HP-16C would cost at least $100. I recommend this model. 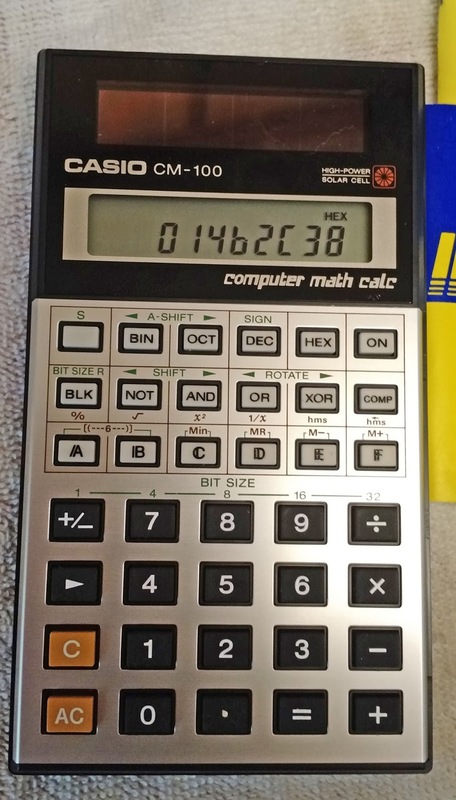 It is convenient way to convert between bases, work with common bit sizes, and execute computer algebra on the CM-100. It’s well worth the price. The program PYTHA calculates a Pythagorean triple. A Pythagorean triple is a set of three positive integers A, B, and C that represent the lengths of a right triangle, with C being the hypotenuse. Hence, A^2 + B^2 = C^2. We can verify that the above formulas for A, B, and C work by showing A^2 + B^2 = C^2. “Pythagorean Triple” Wikipedia. Last Modified February 7, 2017.